The U.S. Federal Reserve didn’t lose much sleep about the spillover effects of its easy-money policies on the rest of the world. But when it starts raising interest rates, the central bank might very well fret about spillback. The term, coined by the International Monetary Fund, describes the threat to U.S. output from slumping import demand in emerging markets. As the Fed pushes borrowing costs higher, capital could flee developing countries, forcing them to cancel investment and settle for slower growth. That would be the spillover. But a buyers’ strike could rebound on U.S. exports of software, machines and services, undermining a fragile domestic recovery. That would be the spillback – and it could be quite significant. 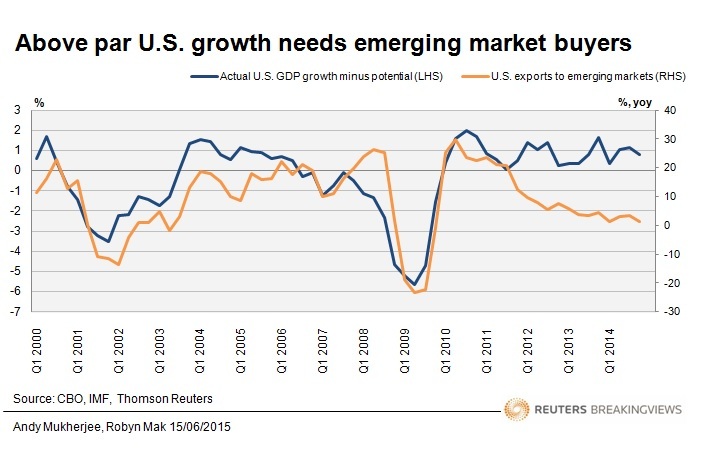 Since the early 2000s, above-par U.S. growth has been associated with strong sales to emerging markets. During the credit-fuelled housing boom, when the American economy’s actual growth rate exceeded the potential growth rate as determined by improvements in productivity, emerging markets ramped up production capacity to take advantage of bubbling U.S. consumer demand. That in turn sucked in U.S. exports, giving the world’s biggest economy a further boost. But now that emerging markets aren’t investing or importing with the same gusto, it’s hard to see how U.S. growth can break free of the speed limit imposed by weak productivity growth. Worse still, if the Fed raises interest rates amidst muted inflation pressures, the spillback from emerging markets could be harsh. Higher borrowing costs in emerging markets and a stronger dollar would further reduce U.S. exports, and the country’s growth rate might slip below potential. Capital inflows amounted to 5.4 percent of developing countries’ combined output last year. The World Bank estimates that figure could shrink by 18 to 40 percent as the Fed raises rates. Such a slump wouldn’t have mattered a great deal to the U.S. economy until the 1990s. But emerging markets, led by China and India, accounted for 57 percent of global growth between 2011 and 2014. Spillback risks of U.S. monetary tightening are both real and large enough for the Fed to lose sleep over them. The World Bank cut its estimate for GDP growth in developing countries to 4.4 percent this year, from a previous forecast of 4.8 percent. The bank’s “Global Economic Prospects” report, released on June 11, now projects a second year of slowdown in emerging markets. As the U.S. Federal Reserve raises interest rates, a 1 percentage point increase in the difference between U.S. long-term bond yields and short-term interest rates could depress capital flows to developing countries by 18 to 40 percent, the World Bank said in its report. Kaushik Basu, the World Bank’s chief economist, said the Federal Reserve should hold off on a rate hike until next year to avoid worsening exchange rate volatility and crimping global growth.